President Muhammadu Buhari is obviously not done with the Peoples Democratic Party (PDP) as he hit the party again monday, dismissing its 16 years in the saddle as extremely wasteful and of no moment. 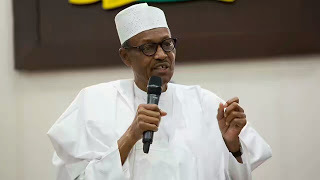 ‘‘I want Nigerians to realise that what this government inherited after 16 years of the PDP government was no savings, no infrastructure, no power, no rail, no road and no security,” he told journalists in his Daura hometown after the Eid-el-Kabir celebrations. The attack, which came through a statement by his Senior Special Assistant on Media and Publicity, Malam Shehu Garba, is the second within two days of efforts to explain the nation’s economic recession that has imposed harsh economic conditions on the vast majority of Nigerians, many of whom are now grumbling loudly, asking the president and his administration to deliver more quickly on the change he promised them during electioneering. The president had in an Eid-el-Kabir message on Sunday blamed the recession on the global economic downtown and lack of savings by preceding administrations. “The present recession is as a result of cumulative effects of worldwide economic downturn and failure in the past to plan and save for difficult times,” he had explained. His comment had attracted a strong rebuke from the PDP which told him to stop grumbling and face up to his task of reviving the economy.